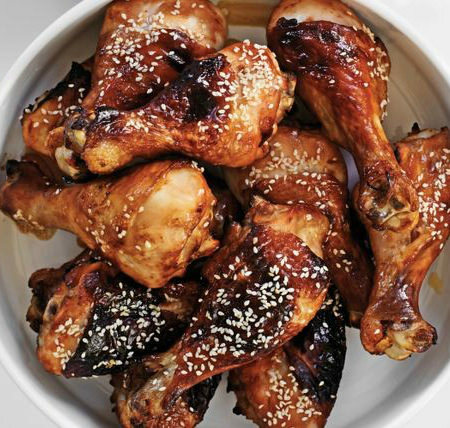 These sticky drumsticks taste delicious but they are so simple and quick to prepare. As an added bonus, the kids will love them! Combine the tomato sauce, soy sauce and honey in a glass or ceramic bowl. Add the chicken and toss to coat. Cover and place in the fridge for 30 minutes to marinate. Preheat oven to 200°C. Line a baking tray with non-stick baking paper. Place the chicken on the tray and bake in oven, turning once, for 40 minutes. Sprinkle with the sesame seeds and bake for a further 15 minutes or until the chicken is golden and cooked through. Place on a serving platter and serve with sweet chilli sauce. Recipe and image courtesy of Taste.